Nucleus Arts Centre, 272 High Street Chatham is the largest studio complex in North Kent with over 45 Artists working in Studios, a café bar- Café Nucleus, Meeting Point Room, kiln and analogue dark room. Sited in a former mews our Chatham site can be found just yards from Chatham High Street (opposite the PDSA Charity Shop), conveniently close to the town centre’s car parks and bus and train stations. Nucleus Arts Centre was opened in 2002 by The Halpern Charitable Foundation as a space for local artists to develop and display their talents. Since then it has grown into an award-winning arts and community base at the forefront of the cultural regeneration of the Medway Towns. CLICK BELOW TO DISCOVER MORE! Nucleus Arts Chatham Gallery is the only dedicated gallery space for hire in the Medway towns offering artists, designers, students, schools and graduates a chance to present their work in a self-curated, contemporary exhibition space. 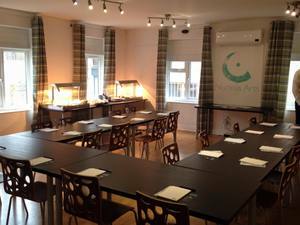 Looking for somewhere to hold a meeting, training session, social group or seminar? Nucleus Arts’ Meeting Point Room is available to hire, located in a secluded courtyard just yards from Chatham High Street. Need a smaller space to hold one to one's, workshops or meetings? The Creative Cabin is available to hire, located in a secluded courtyard just yards from Chatham High Street. This space is free to community groups.